Step One, Step Two, Step Three and Four by Maria Ashworth is a beautifully written and illustrated children’s book about co-mingling families. One day a mother told her daughter that she was getting married. Her daughter began to wonder if she would have to share her mother? Would the special times they once shared vanish? She didn't like these thoughts one bit. Maria takes us on a journey into the thoughts of the child as she begins to visualize how having additional people, whether it is brothers or sisters, would drastically affect her world. She didn’t want any step brothers or sisters; she wanted her life back the way it was. She not only didn't want them in the house, but she had named them Step One, Step Two, Step Three and Four. She even made some rules for them, from don't talk to her to don't touch her things. But one day something changed all of that. I enjoyed reading Step One, Step Two, Step Three and Four by Maria Ashworth. It was hilarious and the colorful illustrations just added an essence of character to the story. When you are the only child, you don't have to share anything. When that is over, you can expect the worst because your world will change, but all is not lost. How do I know? I was once an only child and felt the same way. 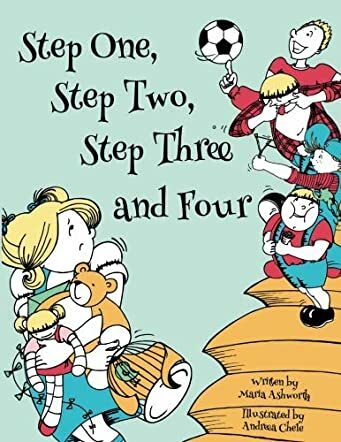 Step One, Step Two, Step Three and Four by Maria Ashworth is an excellent book for educating children on how to deal with step families, which is becoming a normal state of life. Maria, thanks for such a great and engaging story about a serious situation.